Sign hanging outside the Waverly Inn. GREENWICH VILLAGE — A fire broke out Monday evening in the basement of the Greenwich Village brownstone housing Graydon Carter's Waverly Inn. Employees from the famously hard-to-get-into restaurant helped rescue a panicked tenant, a bartender said. More than 12 units with 60 firefighters responded to the 5:20 p.m. call to 16 Bank St., FDNY officials said. The fire was under control by 6:15 p.m. It was unclear how the fire started or if it was connected to the A-list restaurant, which hadn't yet opened for dinner. Even before the Fire Department evacuated the building, workers noted the smoke and went outside. That's when they heard a screaming tenant on the first floor. "She was freaked out. She couldn't get out," said Waverly Inn bartender Andrew Katz, 33. He and a waiter helped carry her out of her window. 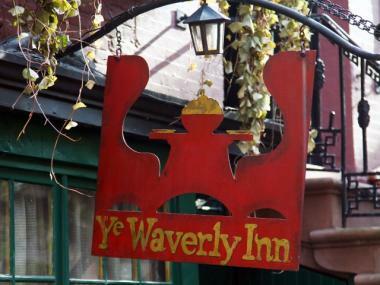 Waverly Inn workers did not immediately know if they would open for dinner Monday night.